Let’s face it. Trust is everything. If you can’t trust an email, you don’t open it. If you can’t trust an employee, you fire him or her. If you can’t trust your spouse, you get a divorce. Handwriting CAN help you decide trust or dishonesty. This is the last article for the National Handwriting Week. This new one hour lecture explains it all … with graphics. 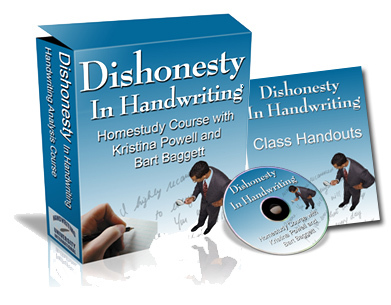 You will love this new “Dishonesty in Handwriting Program”. And, it’s part of the full level 100 / membership program… so you get lots of bonuses and a free ticket to the monthly tele-class with your active membership. The World’s #1 Handwriting Analysis Certification School. P.S. For a limited time, this new online program is just a few dollars! We put this program at this low price for a few days last October and people really responded with glowing reviews. Read all about it here.